For all you Holmes Basic Set fans, you might get a kick out of this. 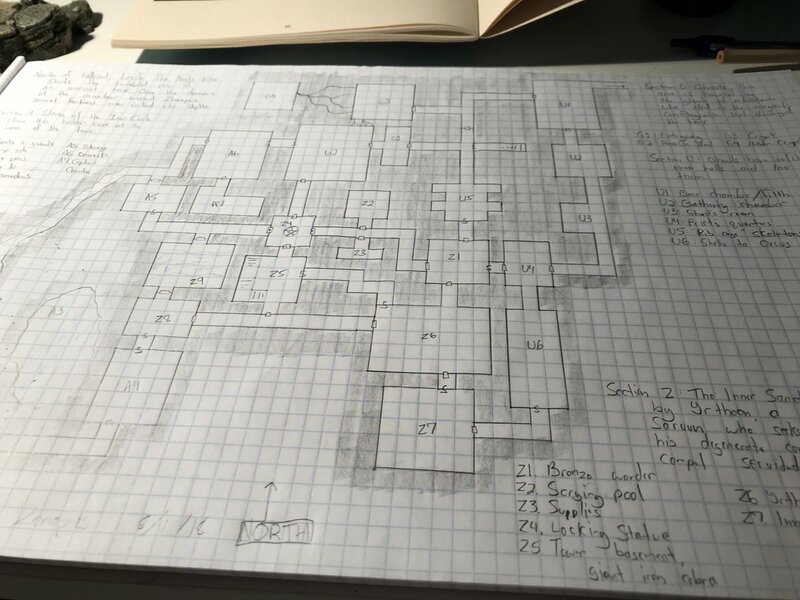 Mike Mearls tweeted a photo of his hand-drawn map of the Zenopus dungeon. Wow, I've never seen anyone use shading before on a hand-drawn map. Ordoalea Publishing on Twitter wrote: Well with this set... You're getting ready for a #megadungeon here? Not for this one - just one level here. The Seven Pillared Hall is the big dungeon of the Nentir Vale. Thanks for posting this, I missed his tweet at the time. I noticed he's running a "Return to the Tower of Zenopus" game at Gary Con this year, so he may be using this map for it. Description: "Long ago, a band of adventurers dispatched by the mysterious sage Jeric D'Holmes plunged into the tunnels beneath the ruined tower of Zenopus. The dungeons beneath the tower were long thought empty, but now ghouls, goblins, and worse plague the small city of Portown by night. Could the source of this evil be found in this supposedly abandoned dungeon?" The game system is listed as Basic D&D, although it's not clear if this means Holmes Basic or one the later iterations. Last edited by Zenopus on Sun Sep 09, 2018 9:44 pm, edited 1 time in total. I'm really late for this party, but I just saw Zenopus' post on G+. At first glance, this does look like the Holmes Basic dungeon, but its not! Heavily influenced by the original, I'd say! This is part of the reason why I still like 5th edition to keep plugging away at it! We used to do this all the time bitd. Even if the DM is the only one to ever see this map (and not show it to players) it does help the DM see the map better, especially if it is drawn in a room with low-light, and taken to the game held in a room with brighter (or different) light settings. I don't know about anyone else, but I've noticed that as I get older, my vision isn't what it used to be, and I've been wearing "coke-bottle" lens glasses since 3rd grade. Either that, or Mike Mearls was on the phone when finishing this map up and rather than doodle in the margins, he shades the blank spaces while talking - like I am prone to do too! I used the Holmes' map in my game last night! I did make a few changes: cut the scale in half to fix the battlemap on the table; scaled it up for two 6th level PCs; and modified it to fix under a dwarven city. Best part is I linked the NPCs together into a gang (the PCs are playing constables), and they managed to escape while the PCs slaughtered their henchmen. Hadn't planned it, but oh, the followup will be epic. (Emphasis mine.) This is the last day you'll be able to say that. I nearly always do, much easier to read at a glance. OT: I know. I miss it already. Don't have the time to go to mewe or any other social media to catch up with Zach and the rest of the G+ gang, although I am signed up to Zenopus Archives at mewe. It just kinda feels like your FLGS getting shut down and all your gaming buddies got evicted. I've been doing it since 1981. I wanted to mimic the look of the printed Basic dungeon. I use cross-hatching instead of shading.